Do you have kids who love cars? Who doodle and draw all the time? Who only read graphic novels? 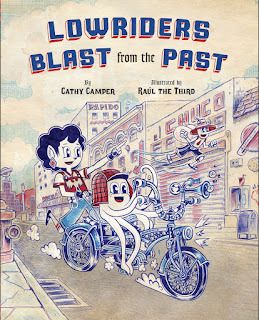 You'll want to race out to get Lowriders Blast from the Past, the newest graphic novel from Cathy Camper and Raul the Third. Not only does this celebrate Latinx lowrider culture, it turns cultural expectations on its head with Lupe's girl-power & fixit prowess. As we celebrate Latinx and Hispanic Heritage Month, you'll definitely want to highlight this series. My students especially appreciate the mashup of cultures, the humor and the Spanish slang. This story brings us back to the origins of Lupe, Flapjack and Elirio's friendship. Mosquito Elirio loves painting more than anything else, especially mixing words with art. He paints giant murals on an alley wall near his home. "This alley wall is my secret studio. It's like my own museum." But when Elirio is bullied by Las Matamoscas, the local gang, he feels alone and helpless, until he meets two new friends, Flapjack and Lupe. Flapjack is a sweet little octopus who's always willing to lend a hand (or eight). And Lupe can fix anything, especially bicycles and cars. I especially appreciate how this series turns cultural expectations upside down. Not only is Lupe a fixit whiz, her Mamá Impala runs the junk store, and her Mamá Gazelle runs a papel picado workshop. "Mama Gazelle's workshop is pretty awesome, right? Want to watch me fix your bike?" Elirio, Flapjack and Lupe are excited to go to Señor Bufolardo's car show. The bullies won't leave the younger kids alone--and they insist that girls can't be in car shows. Will the friends figure out how to get their mamas' car entered, or will the bullies win? 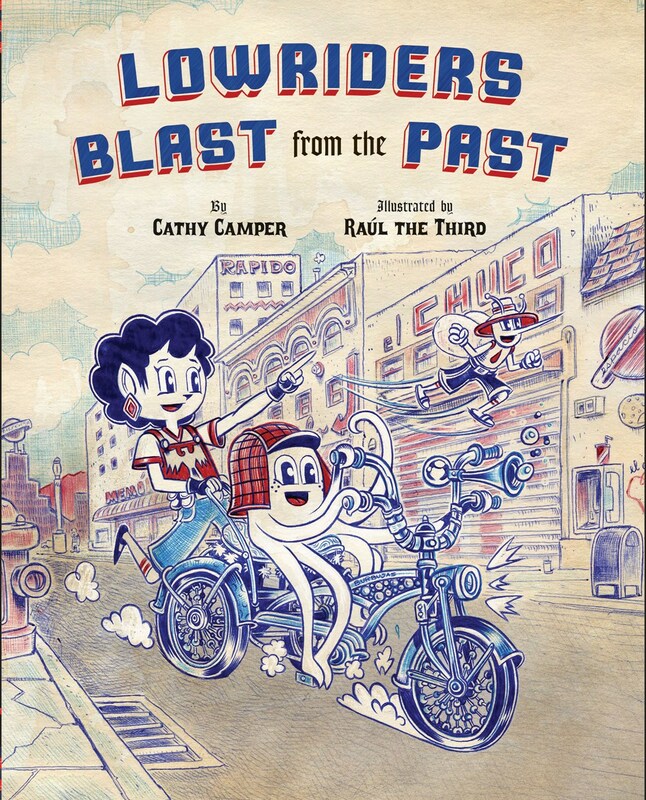 Raul the Third won the 2017 Pura Belpré Illustrator Award for Lowriders to the Center of the Earth, honored for his "energetic ballpoint pen drawings portray a complex mash-up of cultures with humor and verve," as the committee chair Eva Mitnick said. Illustrations copyright ©2018 Raul the Third, shared by permission of the publishers. The review copy was kindly sent by the publisher, Chronicle Books. If you make a purchase using the Amazon links on this site, a small portion goes to Great Kid Books. Thank you for your support.